With attractive flowers and good foliage, Trillium plants are spring flowering and they grow well in the shade. With spectacular flowers, they are increasingly popular with gardeners with shaded areas who are looking for something a little different in both flowers and foliage. They are commonly referred to as ‘Wake Robins’ at least the ones from North America are. However a number of species are from Asia as well. Flower colour varies from pure white, to deep purple, yellow flowering and some varieties with white and pink speckled flowers are also available. Grown for both the flowers, which are unique as well as the foliage which ranges from green to wonderful marbled paterns, these plants range in size from small like the pretty T. rivale, pictured right to quite large imposing specimens. 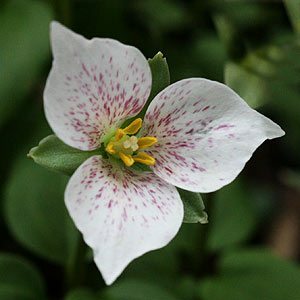 Grown in the garden or in containers trilliums deserve a place in any cool to temperate garden where a little shade is available. Being a woodland plant all varieties require a semi shaded position in rich soil. Dig in lots of well rotted compost, rotted leaf litter etc. Keep moist and be patient and you will be rewarded in spring. Considering growing from seed, these wonderful plants will take some time to germinate and grow to flowering size from seed but are well worth the wait. 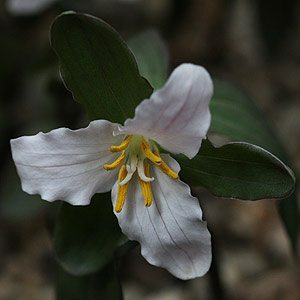 Mature trillium plants are a better option unless you are patient. Established clumps are best left undisturbed for best flowering. The best time to buy is while the plants are dormant in winter, you will find more varieties for sale by mail order than will appear in retail outlets. Mail or phone order plants & bulbs.